Zach, Sam’s new road trip buddy, is a nomad who recently had a successful 9 figure exit from a business he co-founded and is now on the quest of finding the perfect lifestyle. He loves kite surfing, wandering the ocean, and experiencing freedom. After hist big exit, he went on the process of learning new skills which eventually led him to discover his real passion. During the episode, Zach, Sam, and Johnny talk about investing not with money, but with time and knowledge. If we have achieved our financial goal, what then? They discuss what financial freedom really means and what the perfect lifestyle is for each one of them. For expats who love traveling, where in the world would they want to settle? The journey to finding the life you dream of takes time, money, and knowledge. Listen in and learn some tips on how to be financially free and become truly happy. 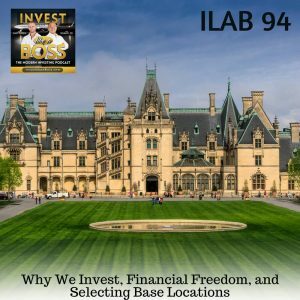 Listen to ILAB 94 on iTunes here or subscribe on your favorite podcast app. 46:36 – What does financial freedom mean? 55:16 – When to stop worrying about money?